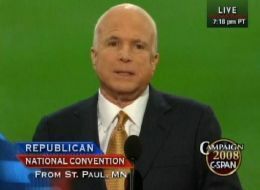 While I was watching McCain's nomination acceptance speech Thursday night I was puzzled why he had the picture of a McMansion projected behind him after the flap of him not remembering how many McMansions he owns. The tight camera shots only showed McCain's head against the grass in the picture, which made it look like he was reprising his famed green screen performance. And when they panned out, it looked like McCain was showing off one of his mansions. Josh Marshall at TPM may have solved the mystery in this posting - "I'm surprised this hadn't occurred to me. But several readers have suggested that perhaps one of the tech geeks charged with setting up the audio/visual bells and whistles for the evening was tasked with getting pictures of Walter Reed Army Medical Center but goofed and got this [picture of the Walter Reed Middle School in North Hollywood, California] instead. At first I thought, No, that's ridiculous. This is a major political party with big time professionals putting this together. Nothing is left to chance. I mean, is this the RNC or a scene out Spinal Tap or Waiting for Guffman? I still have a bit of a hard time believing they're quite that incompetent. But when you figure in what appears to be the utter lack of any logic for this [North Hollywood middle] school being behind McCain and the fact that it has 'Walter Reed' in its name, I'm really not sure you can discount this possibility." Statement from Walter Reed Middle School principal, Donna Tobin, "It has been brought to the school's attention that a picture of the front of our school, Walter Reed Middle School, was used as a backdrop at the Republican National Convention. Permission to use the front of our school for the Republican National Convention was not given by our school nor is the use of our school's picture an endorsement of any political party or view."